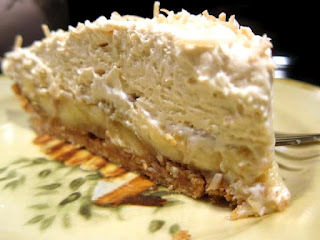 Bananas, coconut, rum and cream.....in pie form. What more is there to say? This is one of the most delicious pies you will ever have and it doesn't hurt that it's easy to make too. Chill the pie for at least 2 hours but I think it's optimum at 4 hours. Enjoy! 1. Put oven rack in middle position and preheat oven to 350°F. 2. Combine & mix graham crumbs, butter, cinnamon, coconut and 2 tablespoons brown sugar in a bowl until combined well. Press crumb mixture evenly onto bottom and up side of 9 inch pie plate. Bake crust 10 minutes, and then cool completely in pie plate on a rack, about 20 minutes. 3. Meanwhile, in a sauté pan over medium heat, combine 1 tablespoon of butter with 2 tablespoons of brown sugar and 1 tablespoon of rum until they melt together. Add the sliced bananas and cook for 2-3 minutes, stirring to make sure the bananas are coated with the butter/sugar/rum. Remove bananas from the heat, toss gently with shredded coconut and let bananas cool. 4. Beat together cream cheese, lemon zest and 1/3 cup brown sugar in a bowl with an electric mixer at high speed until light and fluffy, about 1 minute. 5. Beat heavy cream with 2 tablespoons of rum in another bowl with cleaned beaters at medium speed until it holds soft peaks. Gently stir one third of whipped cream into cream cheese mixture to lighten, and then fold in remaining whipped cream. 6. 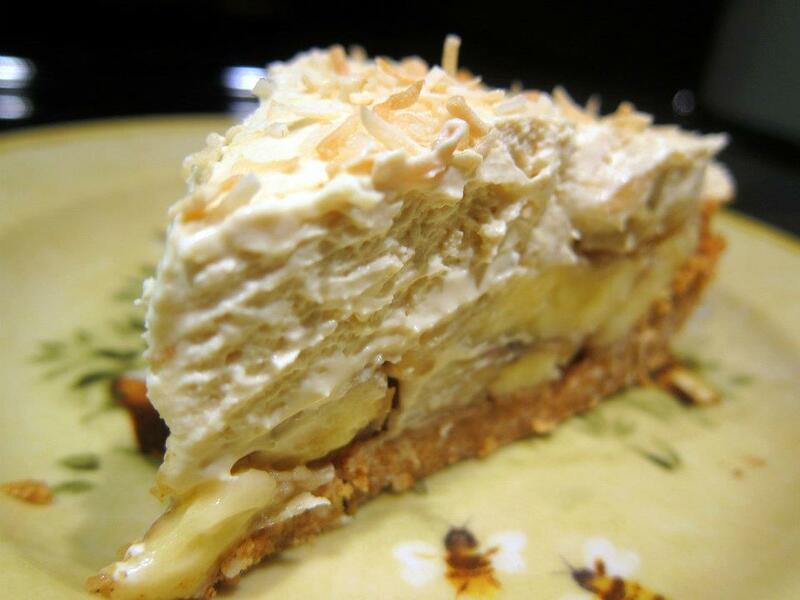 Arrange the banana slices evenly over the bottom of the cooled crust. Spread all cream filling over the bananas. Sprinkle toasted coconut over top. Chill pie for at least 2 hours before serving. What a beautiful recipe- can't wait for another day to play in the kitchen so I can make this. Looks delicious. Maybe not diabetic food though sadly. Um ... drool? :-) I think I will need to make this in the future! This looks even better in the morning...pie for brekkie! I made this pie last weekend for a dinner with my parents and in-laws and it was just DELICIOUS!!! Super easy to make and the taste is incredible... everyone just LOVED it!! Thanks for sharing! I'm so happy I found your blog! If you love cooking as much as I do, go check out my blog where you can find great easy recipes of all kind! So excited to make this for my family!